The objective of this consultation is to gather information from stakeholders on the revised Broadband Guidelines, which lay down how the Commission will apply the EU state aid rules in relation to public support granted for broadband network infrastructure deployment. To the extent possible, please in particular mention individual paragraphs in our draft if you wish to make specific comments. We would appreciate obtaining documents in an electronic format that will enable the reader to copy & paste text. An intelligent and innovative Europe cannot be built without its backbone: next generation broadband access. European policymakers at all levels – regions, states and the EU as a whole – are conscious of this. This awareness has been transformed in various political initiatives, from the EU Digital Agenda to regional initiatives. However, there is a substantial gap between Europe and other developed economies, such as South Korea and Japan, in terms of the pervasiveness of next generation broadband access. A renewed effort and commitment is required to bridge the divide, but most importantly, to also stimulate economic growth through broadband infrastructures and services. There are clear challenges to face – deployment costs, demand uncertainty, and regulatory inefficiencies – but the difficult time that Europe is currently facing requires an exceptional effort in order to drive growth. This effort calls for a more synergic collaboration between the private sector and the public sector in order to accelerate the penetration of next generation broadband access, and transform the urban and rural areas of Europe into a single, unified smart continent. Acreo has carried out a feasibility study to evaluate the socio-economic return of FTTH investment in Sweden, on behalf of the Swedish government’s Broadband Council (Bredbandsforum). The study has investigated the fiber-based broadband effects on economic growth, both at a national level and in individual municipalities. The result demonstrates that a fiber investment generates economic gain in less than 3.5 years. The greatest impact is found for the public sector where the result indicates that communication related costs can be cut by 30-50% thanks to the availability of fiber. The study also shows that the municipalities that have invested in fiber will have a positive economic growth in the form of increased employment and a positive population trend. Acreo has performed a statistical analysis that links the effects of fiber investments, spread over a four year period, to the specific socio-economic factors. The return of investment was then calculated year by year, up to five years after the investment. The study also estimates the investment needed to connect the remaining households that do not have access to fiber. The analysis is based on data from Statistics Sweden (SCB), Swedish Post and Telecommunications Authority (PTS), meta-analysis, Acreo’s own research in the field, and on extensive interview data where Acreo has conducted both surveys and in-depth interviews with local governments, telecom operators and network owners. Traditionally, the success of broadband investments is primarily evaluated from a telecom perspective. For society, however, economic growth and the impact on the public sector are more important success factors for the assessment of the investment. “This feasibility study is the first step to better understand the real social impact of broadband investments in Sweden. It provides a good basis for further discussions in the efforts to spread knowledge of broadband-related issues and its benefits for society” says Patrik Sandgren at the Government Broadband Forum. Acreo is one of Europe’s top research institutes providing breaking edge results within the field of electronics, optics and communication technologies. Turning academic research into commercial products, Acreo offers value-adding technology solutions for growth and competitiveness in industry and society. The types of assignments are ranging from feasibility studies, long term research projects, prototyping and small scale production, to verification and testing. Acreo also supports small and medium sized companies with technology transfer, business networks and financial advice. Acreo is part of Swedish ICT, and has 145 employees located in Kista (headquarter), Norrköping and Hudiksvall, in Sweden. Acreo Netlab is active in the field of Broadband Technology; our activities span core networks through access networks to home networks. We address network design, optical transmission and IP protocols, we measure how networks are used and how network performance influence quality of experience of important services such as video and IPTV. We perform technical research and development; we drive standardization and policy issues as well as analyze business models. 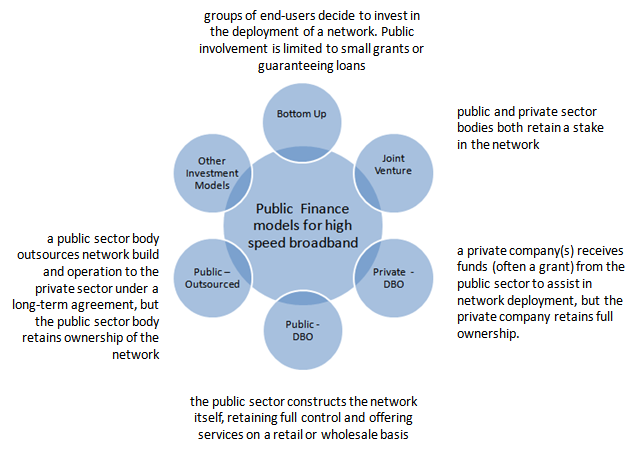 Financing high speed Broadband – what do you think? Challenge – we seek to engage with you and gather a broad range of opinion from a range of contributors across Europe, in relation to these 5 broadband investment models described here.